Lesson 5 (CC2 level) - The Chip's Challenge Wiki - The Chip's Challenge Database that anyone can edit! Lesson 5 is the 50th level in Chip's Challenge 2, and the fifth of the lesson levels. It was created by Chuck Sommerville. Stand on the brown buttons to open the trap. Once you get on a railroad track, you can only change direction at junctions. Railroad tracks can only be entered from the open end. Ghosts can not go through steel walls. Ghosts will not cross water. Ghosts will not cross custom walls or floors. If you bump into walls while carrying the steel foil, it will turn them into steel walls. Use the foil to trap the ghost. Pick up the RR sign to cross railroad tracks. You will need these fire boots to enter the rover room. The rover monsters change mood now and then. Watch them carefully. The shield will protect you from monsters. Purple buttons can be wired to things. This one is wired to two purple toggle doors. The purple buttons turn wires 'on' when something holds them down. Some purple toggle doors are open when their input is 'on', some are closed. They change state when their input changes. Wired traps are open when their input is 'on'. Wires can go through steel walls. Purple buttons can be wired to other things like clone machines. Purple buttons can be wired to flame jets. Flame jets change state when their input goes from 'off' to 'on'. The wire tunnels under the floor here. When you drop a bowling ball it rolls until it hits something. Stand on the red arrow facing the red bomb and drop the bowling ball. Bowling balls can pick up tools. Roll this ball over the flippers to hit the green toggle button. If a teleport exit is blocked, you are teleported to the next station. Push this block between the two red arrows to block the teleport exit. 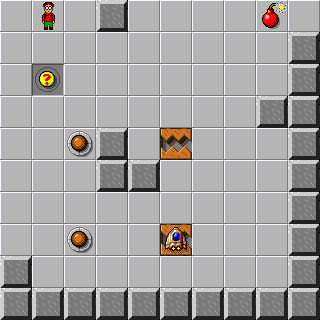 You will have to get this ball to go through the yellow teleport to destory the bomb. If all yellow teleport exits are blocked in the direction you are going, you will pick up the teleport. 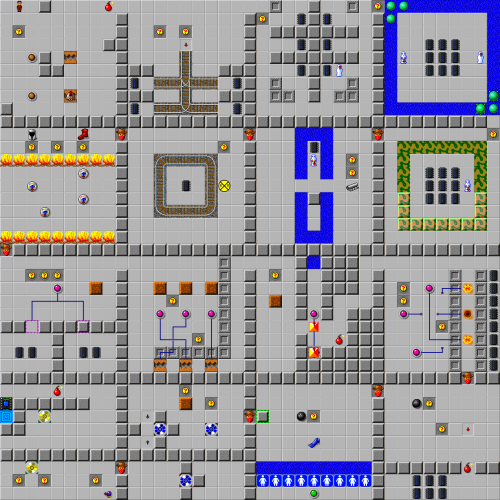 First move the top teleport into the bomb hallway, then move the bottom teleport in front of the ball.